The Arbequina is a handsome, compact olive tree with silvery/gray foliage and small fruit suitable for curing and making olive oil. The fruit is highly aromatic, small, symmetrical and dark brown, with a rounded apex. 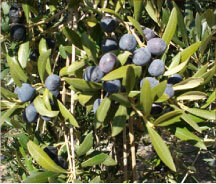 The Arbequina olive yields what’s considered among the more delicate olive oils. This Spanish variety is resistant to frost, is self-fertile, and produces green fruit that ripen to dark brown/black in early fall. The plants are excellent producers, bearing fruit in the first or second year after planting. Beautiful in pots or in the ground, these trees require at least one half day of sun, and will reach 10-15 feet tall. Arbequina trees are adaptable to different conditions of climate and soil, although it does best in alkaline soils; it thrives in long, hot, dry summers, but is frost-hardy and pest-resistant. Its relatively small cup, allows it to be cultivated under more intense, high-density conditions than other plantation olives. The variety is very productive and enters early into production (from the first half of November). The fruit does not ripen simultaneously, and has an average resistance to detachment. Unlike most varieties, Arbequina has a high germination percentage and that makes rootstocks.